Welcome to Genron 7. Genron was established with the intent of publishing nine issues over the course of three years. With the publication of this issue we enter into our nal year. Genron was launched with the goal of reviving the value of criticism. Here “criticism” does not simply mean critique. What I call criticism, rather, is the condition of becoming embroiled in the conflicts unfolding before one’s eyes, the refusal to simplify reality. While leaving complexities complex, criticism is treating particular points of humanistic knowledge sweepingly and theoretically, at times irresponsibly and with a cruel distance. Such positionality is missing from Japan today. an age of populism, the essence of which is closeness. In times when populism rises to its most influential levels, the very act of distancing oneself from a subject is regarded as evil. Politicians, academics, and journalists, too, are only able to uncover proof of justice by cozying up to the persons involved, that is, the players involved in a drama, and rallying and reacting to the most immediate of issues. Genron is a journal that intends to fight against such a zeitgeist, striving to once again reclaim the value of distance. Having said that, I imagine it is difficult to understand the positionality of such a journal. We distance ourselves from the here and now in order to fight against populism. It is for this reason that our political attitudes are not made explicit. As a journal we do not clarify which political party we support nor do we participate in any demonstrations. Rather, we aim to question and overcome the assumption that a reaction-without-distance is the only way one can claim to have confronted politics and reality. Now, so as not to be misunderstood, let me say this: I do not mean that one should refrain from naming the political party they support or from participating in protests. All I mean to say is that these actions do not encompass everything about politics and reality. In Japan today, however, it seems to only be an elaborately crafted escapism or cynicism. Such misunderstandings are difficult to upend because they arise out of widely shared understandings of politics and reality. Therefore, I am beyond thrilled that, despite its aws, our journal has been warmly received for the past two years and has been able to continue publication. It was also a wholly unexpected fortune that our inaugural issue, Genron 0: A Philosophy of the Tourist (Genron 0: Kankokyaku no tetsugaku), became a best-seller and recipient of the prestigious Mainichi Publication Culture Award. These successes do not free me from Genron; instead, I feel they have given me renewed duty to support a space where one can continue to resist the populism encompassing us for as long as possible. It is for this reason that I have changed my plans, deciding not to end the journal with the ninth volume. The first series will conclude with issue nine, but the second series will continue as Genron. We have yet to make any decisions regarding the second series. The layout and frequency of publication may change. The day may come where I step down as editor. Still, for as long as our company exists, that is, for as long as I am a critic, Genron will continue to be an entity that will–must– continue publication. The major theme of Genron 7 is “Russian Contemporary Thought II,” with a secondary focus on rebooting philosophy. As suggested by the title, the topic of contemporary Russian thought is a continuation from our previous issue. 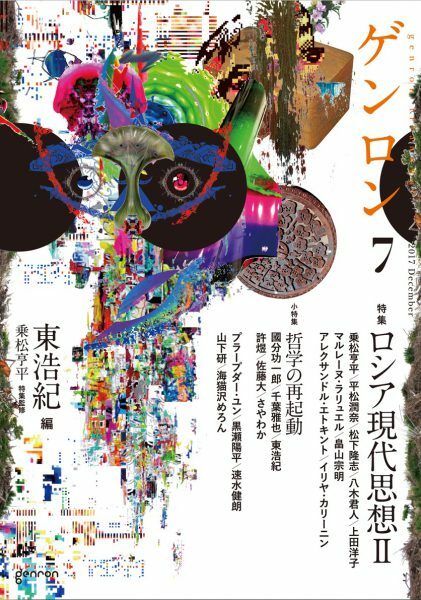 For this special, too, we have asked Kyohei Norimatsu, associate professor of Russian literature at the University of Tokyo, to oversee its completion. Though it is possible to read part I and part II independently of each other, we follow Norimatsu’s lead in conceiving part I as focusing on thought and criticism while part II focuses on society and culture. It is true that part I might have been too highbrow, focusing intensely on Russian contemporary thought. (As a student of philosophy I personally found it exhilarating…) Though we did receive positive feedback from a particular readership, we also received word that some readers felt lost. This time our focus is more concrete in nature, including a round-table discussion that sketches in great detail the changes in post-Cold War Russian society, various timelines, and an essay analyzing the context behind anti- Putin protests. For readers, then, it might be better to begin with this volume. As I wrote in the previous issue, Russian contemporary thought may function as a mirror to help Japanese readers understand their own positions. Russia and Japan are both late-modernized states, both attempted to overcome Europe, and both have at some point taken the United States as their enemy. At present, both are also regarded as weak democracies and as backwards societies that have embraced stances violating human rights. However, both societies are also thought to have been exposed to excessive postmodernization. And yet, the distance experienced by Russia and Japan toward Europe and the United States is expressed in completely different forms in politics and culture. I imagine that introducing the “thought” emerging from a country like Russia or Japan might yield a particular self-re ective effect not found by introducing the “thought” coming out of advanced modernized nations such as the UK or France. For this reason, I am not hoping to simply “import” Russian thought. Far from it. My aim is to use Russian thought as a mirror, slipping in distance between a Japanese readership and the current situation in Japan. With this perspective in mind I would ask you to pay particular attention to the essay by Alexander Etkind, its introduction by translator Junna Hiramatsu, and the relationship between memory and politics treated in the joint discussion featuring Hiramatsu. Japan has problems with its past. The question of how to remember history or how to mourn the dead is beset with an onerous condition that always draws heated reactions both domestically and abroad. The majority of Japanese tend to think this is an issue exclusive to Japan, but Russia faces similar problems. The question of how to think of the Great Patriotic War (1941–1945) or the confusion and pain experienced by Russians when thinking about how to remember Stalinism are reminiscent of the debate between Norihiro Kato and Tetsuya Takahashi examined in the opening remarks to Genron 2 and Genron 3. The reality is that Japan is not alone in its anxiety over whether to affirm or deny its past. I believe it would be good if the presentation of this fact could, even just a little, change the prejudices readers have about this so-called problem of history. This is related to actual politics. In Japan, it appears as if there will be a refrain from proposals or a national referendum on making changes to the constitution while the deep divide between the revisionist faction and the supporters of the current constitution deepens. Here, the questions of whether one is a constitutional revisionist or conservative, on the right or left, or whether you affirm or deny the past, are trumpeted as an apparent dichotomy that causes great concern for the citizens of the nation. As I mentioned earlier, this journal was established to combat such a zeitgeist. For this reason, the past is not something we affirm or deny. Instead, we attempt to insert “distance” between those two choices. While this is certainly an abstract problem, the special feature of this particular volume exhibits concrete means. Such an attempt may be completely null when viewed in terms of political effectiveness, but, even that being the case, I believe criticism works in such a way. Such a strategy is also related to the other feature of this volume, namely, a reboot of philosophy. For this I have invited philosophers Koichiro Kokubun and Masaya Chiba, two prominent figures of the 2017 boom in humanist writings; organized a round-table discussion on the theme of cyberpunk; and prepared the first Japanese translation of Yuk Hui, a young philosopher born in Hong Kong who currently resides in Berlin. on the cutting edge of things, tied to a more hybrid and ambitious information/ visual culture. The round-table discussion focusing on cyberpunk fulfills that role. Thirdly, I present Hui’s essay as, above all else, an example of a third possibility of our journal going forward, namely one existing beyond the borders of the nation: collaboration between contemporary philosophers from Asia. Hui is a true multilingual. In addition to his native Cantonese and Chinese, he moves freely between English, French, and German, and is also active in Russian. Translations of his work into Korean is also progressing. For some reason, however, he has yet to be introduced to Japan. I first learned of him in the autumn of 2016 at a symposium in Hangzhou, China. After returning home I received a copy of The Question Concerning Technology in China: An Essay in Cosmotechnics. I decided to have it translated immediately after reading it. Though only the introduction will be published here, Hui attempts to build a new platform in which traditional Chinese thought and contemporary Western thought, in particular Heidegger, shed light on and inform each other. At the core of the piece is Hui’s philosophical interpretation of technics and technology. Hui does not limit himself to European thinkers such as Gilbert Simondon and Bernard Stiegler. Instead, he mobilizes philosophers from the Kyoto School or Chinese New Confucianists, as well as Aleksandr Dugin, whom we introduced in the previous Genron. I was, more than anything, struck by the ambitious scale of the project. Hui is more than 12 years my junior. Outside of Japan he is trying to restructure Eastern philosophy while referencing Japanese philosophers. I felt as if I must introduce this reality to readers in Japan. In Japan, the interpretation of the Kyoto school has become impaired due to its historical background. For this reason, there are few comparisons between it and New Confucianism. Such an impairment, however, is certainly natural as the Kyoto school did not explicitly oppose the Greater East Asian War. Here, too, we run into the problem of memory and politics. Abroad, however, we see the emergence of an environment in which the Japanese language has been shed and philosophers such as Kitaro Nishida and Keiji Nishitani are being read and connected to a global context irrespective of the necessity or confusion of postwar Japan. Such a reading is, in a sense, irresponsible and cruel. It would be difficult for a Japanese readership to reach a similar state. And yet, it must be reached. There is no question that this is also just one philosophical possibility of the Kyoto school. Here we also encounter the problem of distance. Sometimes it is necessary for us to distance ourselves from ourselves in order to know our potential. As I mentioned earlier, thanks to the success of texts such as Kokubun’s The World of the Middle Voice (Chudotai no sekai), Chiba’s The Philosophy of Learning (Benkyo no tetsugku), and my own Genron 0, the first half of 2017 saw the arrival of a completely unexpected boom in humanist writing. There were whispers of the revival of philosophy and criticism. The title of the secondary feature agrees with such a situation. However, if that revival does nothing within us to create distance–that is, if there is no acceptance of an irresponsible and cruel viewpoint from the outside when engaging in philosophy or criticism in Japan–then the boom was, after all, nothing more than a boom, a passing moment. The translation of Hui contains such a self-admonition. I wrote that it was the viewing of ghosts, and in Genron 6 I wrote that it was being in the position of a recipient. And in this issue I argue that criticism is the revival of distance. A postwar malady. The vision of a ghost. A passive position. And the revival of distance. Though such descriptions may seem disparate, in my mind they are all closely connected. Criticism is an act in which reality and language cannot perfectly align, where it is de ned by an acuity to such an impediment or impossibility. Given such a de definition, then, it is impossible to de define criticism in perfect terms. Regarding the question of exactly what criticism is, one must speak of it using different metaphors each time while also viewing it from different aspects. This journal will, as much as possible, continue to be acutely aware of such an impediment and impossibility. Moving forward, Genron will likely continue to avoid words that neatly overlap with the politics of here and now. Though many readers might nd this irritating, this is the mission of our journal. We ask for your continued and long-reaching support. In our special feature on “Contemporary Russian Thought” spanning two issues of Genron, the first issue focused on philosophy; the present issue focuses on society and culture. Five specialists on Russian literature and culture gathered for a roundtable to discuss various issues regarding contemporary Russia. To begin, Kyohei Norimatsu raises the importance of the “trauma of defeat” in modern and contemporary Russian history. In contrast to the 1990s, when Russia accepted its defeat to the West and sought to assimilate with it, in the 2000s it denied this defeat and sought victory over the West once again. Takashi Matsushita argues that there was a shift in literature from postmodernism to a “new realism” that corresponded with this change. Furthermore, this change can also be compared to the shift from “Culture One” (the avant-garde during the Russian Revolution) to “Culture Two” (Stalin-era socialist realism) described by Vladimir Paperny. Junna Hiramatsu focuses on memories of the Second World War as a phenomenon that is related to this shift. Though victory in the war has been increasingly trumpeted in Putin-era Russia, this was in response to criticism against the Soviet Union by Eastern Europe and the Baltic states (as well as by Western Europe and the United States, as a result of the former’s lobbying efforts). As nationalism rose on a popular level, liberal counter-establishment movements have struggled. As an example, Yoko Ueda points to the plight of counter-establishment art from the perspective of gender. In examining the anti-government demonstrations of 2011-12, Naoto Yagi attempts to find hopeful possibilities amidst its similar struggles. The radical shifts from “Culture One” to “Culture Two” and from acceptance to denial of defeat have been repeated throughout the modern history of Russia. Hiramatsu argues that this is due to Russia’s “semi-peripheral” place in the modern world system. Russia is at once a colonial power (victor) as well as a colonial supplier (vanquished) of resources, and had little choice but to exploit its own country. The anti-American policies of the Putin government and the struggles of pro-Euro-American liberals in Russia must be understood from this historical perspective. The liberals’ path to breakthrough might be found in effectively shifting and using memories of defeat. In this article, Yagi analyzes the goals of the St. Petersburg-based leftist art group “What is to be done?” (Что делать?) and the poet Pavel Arsenev, a central figure in Translit, a magazine of literature and criticism. Yagi does this from the perspective of building an alternative domain that is neither official nor private, but something that is in a way public. The activities of the unofficial artists of the Soviet era serve as a basis for comparison. For example, the activities of the unofficial art group “Collective Actions” (Коллективные действия) and “The Foundation of Saint-Petersburg” action carried out by “What is to be done?” share the fact that they present the topos of the “suburb” as an unofficial domain. Yet, while the former does this by way of extending a private space built with friends and acquaintances who are participants in the action, we can say that the latter attempts to create a domain that is neither private nor official by entangling citizens through their action. Furthermore, this trajectory is not simply aimed at the “suburbs.” Arsenev tears open alternative spaces within urban spaces dominated by global capitalism by reciting poetry in the streets or writing the poetry of Andrei Monastyrski, a central figure of “Collective Actions,” in graffiti form onto the cityscape. The significance of introducing poetry into the streets and creating something public becomes clearer when compared to Soviet-era perceptions of space and how these were confronted by unofficial artists. With this in mind, this article also ponders the significance these artists found in the large-scale anti-government demonstrations of 2011-2012. To Eisenstein, who began his career in theater, each and every experience, even if it is a mediated experience, cannot be separated from the audience’s perception. He connected this cognitive premise to his unique dialectic speculation that the leap from individual experience to“sensual thought”would occur through the“perception of motion.” As a result, he examined mediated perceptions such as film and animation by constantly comparing his observations of the bodily movements of different actors. Here, Hatakeyama traces the philosophical and aesthetic meaning of internal sensation, which Eisenstein attributed to the experience of movement, as well as the influence it had on his film theory. In doing so, Hatakeyama’s article references the comprehensive media history developed in recent years by Hiroki Azuma, as well as the concept of the “predicate” developed by Kitaro Nishida, a philosopher of the Kyoto School who was active during the same time as Eisenstein. Viewing Eisenstein through the lens of Japanese philosophy and criticism reveals a new facet of his thought, which was previously divided into the two extremes of a universal “theory” and “Russianness,” and places it in a more global context. There was a boom in philosophy books in Japan during 2017. The participants in this roundtable, Koichiro Kokubun, Masaya Chiba, and Hiroki Azuma were some of the central figures in this development. Kokubun and Chiba are Deleuze scholars of the same generation, and are also good friends. According to Azuma, the difference in their approaches to Deleuze lies in Kokubun’s focus on connections to the Other, while Chiba focuses on disconnections from the Other. Both acknowledge that this difference is related to the fact that they differ in their respective understandings of subjectivity. Kokubun attempts to dissolve the fixed subjectivity of modernity by blurring the contours of its separation from the Other. Chiba, on the other hand, is trying to carve out a tentative subjectivity from the postmodern condition where everything has dissolved into one another. Yet, both agree that they are aiming at a subjectivity that lies in a “middle strata” that is neither fixed nor an indeterminate dissolution between Self and Other. However, there is a problem with the idea of a “middle strata” subjectivity itself: it cannot be applied to politics because it renounces modern communication. According to Azuma, a market in which exchange and gifting become as one holds promise as the site for a new “politics,” but the concept of “politics” must be redefined. The participants also explore Deleuzian “desire” as a lens for understanding the rise of populism, which is a new “politics” directly related to the “desire” of people. For Chiba, an issue is the attempt to tentatively fix the “domain” of subjectivity under the anxieties of the global economy. For Kokubun, an important theme is that of everyday “extravagance,” in which each person comes to discover and treasure their own “essence.” Here, too, it is clear that Chiba and Kokubun are using different sets of words in approaching similar issues. Is there a Future in/for Cyberpunk? The 1980s saw the advent of “cyberpunk,” a subgenre of science fiction that depicted intersections between the giant network of cyberspace and decadent futuristic cities. Now, some thirty years later, what are the possibilities of cyberpunk thought? The scriptwriter Dai Sato and the critics Sayawaka and Hiroki Azuma discuss this question. In the second half of the roundtable, the topic turns to the connections between cyberpunk and virtual reality (VR). In film and anime, the rectangular screen has come to play the role of a “window” to another world; but what type of expression is possible in the case of VR, which has no such window? Sato states that theme parks and shopping malls could suggest some answers here. In theme parks and shopping malls, rather than look at reproduced stories through a window, one is immersed using rides and one’s own body. In addition, the time of the story can be manipulated and shortened without using montage technique. Azuma notes that moreover, another intersection between these material experiences and VR is their affinity with the habits of humans who desire “repetition of the same things.” These human traits can also be seen in the behavior of tourists who like to visit places that they have seen before. Finally, Sayawaka summarizes the reasons why the philosophical themes that cyberpunk used to possess—interrogating humanity and reality—are no longer being updated, postulating that this may be due to the difficulty of creating the fiction of a “separate reality” in light of the development of information technology. Sato states that through various methods such as trying to make people vicariously experience death, which cannot be vicariously experienced, and trying to share strange and frightening things with other people in a deliberately “cute” way, cyberpunk has possibilities that extend beyond the cyberized and VR. In our experience of viewing an image, there are two aspects that affect one another: the media that projects the image and our senses that perceive it. The 2011 Great East Japan earthquake caused a tsunami which completely altered the landscape of the Tohoku coastline and shook our perception of reality. At the same time, the earthquake was a disaster that was recorded through a multitude of means, thanks to the ubiquity of cameras that have become increasingly compact and sophisticated. We can notice these changes in both media and our senses through two visual works that attempted to restage the Tohoku earthquake, Shin Godzilla (2016, dir. Hideaki Anno) and Your Name (2016, dir. Makoto Shinkai). The transcendental image of a computer-simulated Godzilla shares the screen with an empirical image of the greater Tokyo landscape in Shin Godzilla, while Your Name utilizes landscape photographs taken by a camera that are then reworked into an animation that is in accord with the two-dimensional characters. Yamashita calls the former an “interfacial image,” which reveals the boundaries between images that possess different rules, and the latter a “semi-transparent image,” which possesses an intermediate character that does not conform to the rules of either image. We can find such images in the Meiji era, when Japan modernized and both the media environment and sense perceptions changed. Both are visible in the paintings of the late Edo period when geometrical perspective was introduced, as well as the early Meiji period when photography and optical lanterns were introduced. The difference between the Meiji era and today lies in the fact that our image of landscapes is being re-transcendentalized, and this is deeply related to the changes in landscapes brought about by the earthquake. Japanese modern art developed by washing its hands of religion. This was also the aim of modern art from the West, which was Japan’s model for its modernization. However, other Asian countries which, like Japan, modernized later than the West, did not necessarily modernize by cutting ties with their gods as did Japan. For example, in countries such as India and the Philippines, religious and spiritual paintings were created by using modern techniques adopted from the West. Tenshin Okakura, a key figure in directing the modernization of Japanese art, corresponded with the religious figures and artists of India’s Bengal School at the beginning of the twentieth century. In turn, Indian artists influenced by Okakura used techniques learned from Japanese artists to create new religious paintings. However, after Okakura’s death, Japanese art lost its connection with India. In this essay, Kurose explores K. G. Subramanyan, a prominent Indian artist and descendant of the Bengal School whose works appeared in documenta 14. By looking at the history of Subramanyan’s paintings, Kurose traces a modernization process in Indian art that differs from that in Japan. Kurose also takes up the case of Buddhist-themed paintings made in the 1920s by the Japanese surrealist artist Harue Koga. Using these, Kurose analyzes how the religious and spiritual elements, which appeared in the course of the modernization of Japanese art, have come to be erased. There have been “Sakigake”-like groups in Murakami’s works written prior to 1Q84. The Ami Hostel in Norwegian Wood (1987) is one such example. Common among them is that they are utopias outside of reality and cut off from worldliness. Many groups in reality have tried to build such utopias in Japan as well. Examples include Aum Shinrikyo, which served as Murakami’s model for “Sakigake,” and the Yamagishi Society, whose member Atsuyoshi Niijima, served as the model for “Fukada.” Omoto-kyo, repressed on two different occasions in the Taisho and Showa eras for seeking to build a pseudo-state within Japan, is another example of such a group. Omoto-kyo and Aum did not dream of building a pseudo-state because they were fanatical cults. The desire for a pseudo-state has been repeated in the form of student movements and the Yamagishi Society as well. The practice of reproducing Japan in miniature to resist the state has been repeated often, manifesting both as incidents and representations. 1Q84 is a story that describes this repeating history in the abstract. In post-earthquake Japan in 2029, people are able to predict everything about the future by using a mysterious quantum computer while they inhabit a phantasmal society created by augmented reality. In the city of Tokimeguri, a Special Zone for Reconstruction in the Tohoku area, strange dealings as well as life-or-death fights take place among the mysterious and wealthy Tokihori family, who show an unusually strong interest in time, the police, and an artificial intelligence that moves in the shadows, each for its own reasons. On the night of the summer festival, our protagonist, Torihiko Shiratori, meets Yuyuka, the daughter of the Tokihori family. This meeting results in him being dragged into this conflict. With the Tokimeguri-sai festival only a few days away, a pre-festival event is held. Near a shrine buzzing with tourists, Torihiko is spoken to by an old acquaintance, the detective Haori Kiryu. While Torihiko had been locked away in the Tokihori family estate, the Kakuriyo, augmented reality device that he had been ordered to build for the Tokimeguri-sai by Miyu, the wife of the head of the family, had a brainwashing device’s data used on its program that had been developed by a new religion and ordered through a request to Kiryu. When Kiryu asks what the data were being used for, Tokihori confesses to planning a large-scale crime. This involved making use of a unit that was part of the brainwashing device that magnetically stimulated the brain to return human brains to a bicameral mind state, the way they were over 3,000 years ago before the birth of the concepts of awareness and time. Kiryu decides that he should not intervene in this case and turns down the request to find the location of the Tokihori family estate so that Torihiko can complete the Kakuriyo. However, as they part ways, Yuzu, the Tokihori family maid, happens to pass by. Torihiko swoops down on Yuzu in order to get from her the location of the estate, which is hidden somewhere in spacetime.